Have you ever found yourself scrolling through Instagram, only to land upon a snap of an outfit that leaves you saying, "I need to buy [insert item] ASAP"? It's happened to us, too. 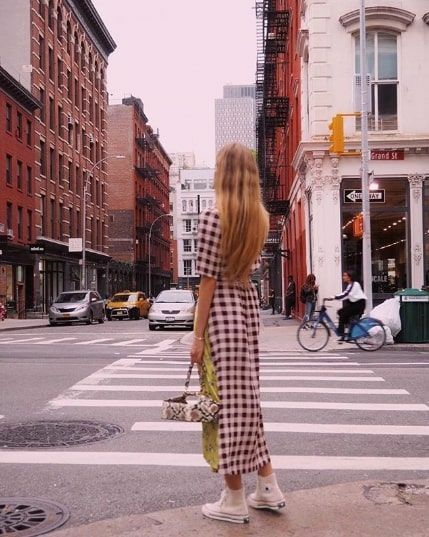 Most recently, we've seen a consistent dose of checkered dress outfits flooding our feed, seriously inspiring us to invest in the printed piece for fall and winter. What's not to love? It's easy to wear (which is always a bonus), can be styled in so many ways, and acts as the perfect base upon which to build the rest of your look. Team it with sneakers for an unexpected but nonetheless welcomed combo, or style a black-and-white checked piece with white tights, white boots, and an oversize faux fur coat for a great holiday season look. Do we have your attention? Ahead, see the 15 checkered dress outfits we can't wait to copy; then, shop our favorite check-print dresses for fall. Team a checkered dress with high-top Converse. Throw a trench over your dress on a rainy fall day. Stick with a black-and-white pattern and add a pop of color with your accessories. The perfect casual-chic (and comfortable) fall look. Throw a leather jacket over this to make it more fall-appropriate. This look is perfect for the holiday season. Pair unexpected pieces, like a track jacket and sneakers, with your checkered dress. A denim jacket will always be a great layering piece. We love this combo of a plaid minidress and neon orange sneakers. For a warmer fall (if you live in L.A., for example), try a wrap minidress in a check pattern. A checkered midi dress can be styled in so many different ways this fall. Throw a bright belt over a black-and-white check dress. This is the perfect office look. If you're feeling bold, try a ruffled checkered dress. A perfect maxi dress to wear with your favorite fall boots. A wrap dress is a must-have. This one is so good. Throw a poppy pink jacket over this one for chilly days. The lamé effect is unique and statement-making. The subtle velvet trim adds a luxe touch. We can't pass up a good asymmetric dress. Throw a leather jacket over this checkered dress. Style this one over your favorite turtleneck bodysuit. A wool dress you can wear in the fall and winter. A checkered dress outfit is sure to garner you tons of compliments this season.